I think if I could stay out of thrift shops and second hand stores I could get a handle on my ever growing yarn stash and thus catch up on the mountain of unfinished projects. the problem is bigger than me! grabbed it before anyone else spotted it. In a giddy "rush: I made my way to the register. The woman behind me said "good find" while others nodded in agreement. "It is," I said proudly. (the bragging rights definitely helped make the purchase worth it. )"What will you do with it?" another asked. "I haven't a clue," I confessed. I knew time would tell....and it did. 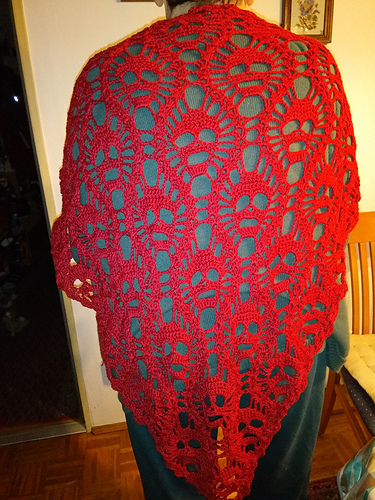 By October I had signed up for a Christmas Swap through Ravelry My assigned swap partner was a lovely woman from Germany who I learned through corresponding over the internet that among other things she likes the color red and skulls. 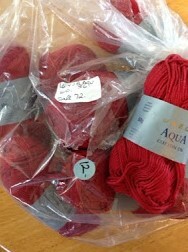 It took no time at alI to find a pattern and get crocheting. I worked very hard and while it was a ton of work I was able to complete and ship it in time for Christmas. My swap partner was surprised and very pleased with her gift. She seemed genuinely appreciative of the shawl and my efforts.